Last week a Bill in US Congress made surprisingly smooth progress through the House of Representatives on its way to the Senate. 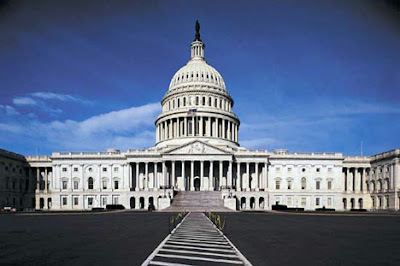 The House bill establishes a Western Hemisphere Drug Policy Commission which will have two million dollars to investigate and research independently of the political process - "to review and evaluate United States policy regarding illicit drug supply reduction and interdiction". What's interesting about the planned independent drug policy commission is that the idea didn't come from a pro-legalization advocate, nor any leftist or libertarian crusader. The sponsor of the bill, Rep. Eliot Engel (D-N.Y.), opposes decriminalization of drugs for non-medical use, and is as mainstream as members of Congress come. But Engel's frustration over the results of the U.S. war on drugs is symptomatic of Washington's growing skepticism about U.S. anti-drug policies these days. The premise of the commission is not, of course, that we’re doing great but that our policies aren’t working and we need a rethink," says John Walsh, who works on drug policy at the Washington Office on Latin America (WOLA). He says actions like this "speak to the level of frustration" over the impotence of past drug policies. "You need to take it to the level of an independent commission to get it out of the crevices of politics," says Walsh. WOLA released its own recommendations Tuesday on new directions these policies could take. Their report says past policies that have focused on eradication of coca and opium crops are counter-productive unless they are preceded by rural development. "Proper sequencing is crucial: development must come first," it reads, or else, without alternative livelihoods firmly in place, people will have no choice but to return to growing crops for illicit markets. The Commission shall review and evaluate United States policy regarding illicit drug supply reduction and interdiction, with particular emphasis on international drug policies and programs directed toward the countries of the Western Hemisphere, along with foreign and domestic demand reduction policies and programs. The Commission shall identify policy and program options to improve existing international and domestic counter-narcotics policy. This is of particular interest to me because I met with a staffer from Rep Engel’s office when I was in Washington a few weeks ago, following my visit to the Drug Policy Alliance (DPA) Conference in Albuquerque. During the meeting, which I attended with Bill Piper from the Drug Policy Alliance, Eliot Engel's staffer suggested that if it went under the radar, it could clear the Committee by December. Amazingly, they managed it. Mentioned the potential political synergy between the US and UK if David Cameron gets in. Both Obama and Cameron, before becoming leaders of their respective parties, went on the record critiquing the war on drugs (and both former users). Suggested that the US review drug policy, as per our calls for Impact Assessment. The pitch was universally well received, but had special support from both ends of the political spectrum, in the persons of Congressmen Rohrabacher and Kucinich. I also had the opportunity to meet with Senator Jim Webb, who has his own bill, scrutinising the whole of the US criminal justice system, (with a particular section on drug policy) making its much slower way through Committee stage: National Criminal Justice Commission Act of 2009. Unfortunately the Webb Bill, hit the media and the radar, and has been mauled by those trying to water it down with substantive amendments. 2:00 – Meet w/ Rep. John Conyers (D-MI). Conyers chairs the House Judiciary Committee and is on DPA’s honorary bar. On Human Rights Day 10.12.09, Transform Drug Policy Foundation welcomes the launch of the International Centre on Human Rights and Drug Policy. The launch announcement is copied below. Today, Human Rights Day(10 December 2009), is the occasion for the launch of the International Centre on Human Rights and Drug Policy. The Centre is dedicated to developing and promoting innovative and high quality legal and human rights scholarship on issues related to drug laws, policy and enforcement. It pursues this mandate by publishing original, peer reviewed research on drug issues as they relate to international human rights law, international humanitarian law, international criminal law and public international law, and fostering research on drug policy issues among postgraduate law and human rights students at universities and colleges around the world. The Centre’s work is supported by a prestigious International Advisory Committee as well as two Institutional Partners. The International Yearbook on Human Rights and Drug Policy is the first and only international peer reviewed law journal focusing exclusively on human rights and drug policy. We are now accepting submissions to the first edition of the Yearbook to be published in late 2010. The Human Rights and Drug Policy Project is a joint initiative with the Irish Centre for Human Rights, Faculty of Law, National University of Ireland, Galway. This Project will establish a Doctoral Studentship in Human Rights and Drug Policy, as well as a programme of activities designed to promote research on drug policy issues among other university human rights programmes. Applications for the Doctoral Studentship are being accepted until 18 December. Foreign Policy magazine have produced an excellent graphic/schematic , by Beau Kilmer and Peter Reuter, showing the inflationary price effects of the illicit market as heroin and cocaine transit through the criminal chain from producers to users in the West (the first page is below - the full article with references is here). 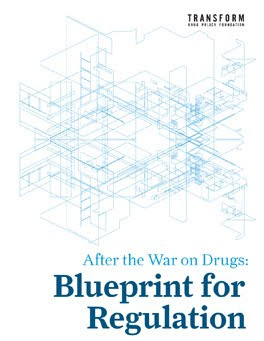 Unlike the analysis in the Foreign Policy piece that argues, rather lamely, that 'Answers are hard to come by in the quest to fight drugs' , the existing and functioning legal markets for heroin and cocaine, combined with the regulatory models for opiates and coca products discussed in Blueprint, do offer a basis for serioous discussions on ways to effectively combat the illicit trade and its associated problems - and also provide a sound foundation for addressing the longer term public health challenges of problematic use. See story on the decision from Czech news agency CTK. 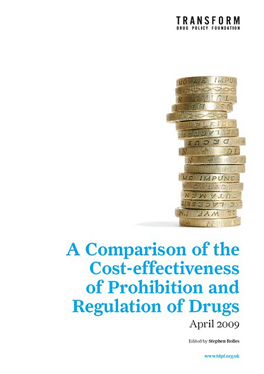 A new report from DEMOS, titled CONNECTING THE DOTS includes a chapter on drug policy in the UK. ‘soft on drugs’ – which remains a politically potent accusation." Last week I received a response from Antonio Maria Costa - Executive Director of UN Office on Drugs and Crime - to a letter requesting that he desist from calling advocates of legalisation and regulation 'pro-drug'. "The crime and corruption associated with the drug trade are providing strong evidence to a vocal minority of pro-drug lobbyists to argue that the cure is worse than the disease, and that drug legalisation is the solution." "Why unleash a drug epidemic in the developing world for the sake of libertarian arguments made by a pro-drug lobby that has the luxury of access to drug treatment?" Mr Costa chose not to reply, only to respond. Here is the letter I sent. The response is below. Thank you for your letter replying to mine of 1 Dec 2008, clarifying that it is organisations like Transform to whom you are referring when you suggested at the NGO event Beyond 2008, that our position could be summed up as “No to Marlboro, yes to skunk”. You use the term “pro drug lobby” regularly to describe those calling for drug law reform, for example in the preface to the World Drug Report 2009. I would like to raise some significant concerns with you about the use of the phrase “pro drug” in reference to organisations such as ours. This term is used pejoratively to portray supporters of legalisation and regulation in a poor light. We believe it to be inappropriate for the head of UNODC to single out a particular group of NGOs and caricature our position in this way. I would ask you to read some of our materials on our web site and consider anew whether we are indeed “pro drug”. My guess is that your use of the phrase arises out of a misunderstanding of what we stand for, combined with what is commonly referred to as a false binary. We are indeed, strongly opposed to some of the positions held by those in the anti-drug movement. However, you then make the false assumption that we must therefore be “pro-drug”. I wish to state categorically that we are not pro drug. We are neither pro nor anti drug, rather we are in favour of strong government regulation. In our collective experience it is unhelpful for us to position our organisation as being for or against the existence or use of drugs, whether they be licit or illicit. The UK Government is not pro alcohol and tobacco, just because it maintains support for their legally regulated sale. We support and promote drug policies that are effective, just and humane; that support the UN’s three pillars – human development, human security and human rights. Transform, you, and indeed all those involved in the UN process share the common goals of reducing the harm caused by drugs (and bad drug policies) to individuals, communities and nation states. Given that this is the case, the most appropriate way to achieve that is to engage in meaningful dialogue with all stakeholders who take an evidence-based approach. Using pejorative and un-evidenced language, in suggesting that we are pro-drug, is partisan and inappropriate, coming from the head of the agency tasked with promoting inclusivity in the engagement of those in civil society in the drug policy making process. Since gaining ECOSOC consultative status, we have been made to feel singularly unwelcome at UN events where repeated slurs have been made on our work. Lastly, portraying us negatively does nothing to promote our engagement in the UN process and gives a poor impression of the agency charged with facilitating civil society input at the UN. We respectfully ask that you write to confirm that you will in future desist from using this kind of un-evidenced and pejorative language. Should you wish to meet to discuss this further, I would be happy to do so. I thank you for taking the time to consider this request. I would like to acknowledge receipt of your letter dated 6 October 2009, regarding our use of the term 'pro-drug'. I have taken note of your statement that your organisation is neither pro nor anti drugs, but rather in favour of strong government regulation and would give this my full consideration. Transform have prepared a response to the Home Office review of the ACMD available in pdf here*. The introduction is copied below. Transform is supportive of the concept of an independent expert Government advisory body on drugs and drug policy. In such a highly emotive and politicised policy area as drugs, the existence and independent functioning of such an entity becomes all the more critical; able to objectively review and speak to the evidence and make pragmatic recommendations on key questions based on science and rational analysis, rather than politics or ideology. Whilst Transform have been impressed by the consistent level of expertise, thoroughness and rigor of the ACMD’s outputs, we have also been critical of them on a number of fronts, both analytical and procedural. Some of these criticisms are outlined – with proposed solutions – in this submission. However, it has become clear that the ability of the Council to function properly is critically, undermined by the nature of its constitution within the Misuse of Drugs Act (MDA), and its corresponding operation within the ambit of the Home Office. The discussion and proposals made in response to the questions posed by this review can hopefully offer some short term improvements, but are essentially band-aids for the wider malfunctioning of a system in urgent need of root and branch reform. We have touched upon the more profound systemic problems with the ACMD, the classification system and the MDA throughout the following discussion as they inevitably frame other responses – but have not explored them in the depth they deserve as they are clearly beyond the remit of this narrowly defined review. We would, however, hope that one of the recommendations to emerge from this process is for the review of the classification system, promised to Parliament by the then Home Secretary in January 2006 and then dropped by his successor, be revisited and undertaken with some urgency. The proposed review enjoyed, as far as Transform is aware, universal support in the drugs field, as well as from two Select Committees, and indeed the ACMD itself. The reasoning given by Government for abandoning the review - that it ‘believes that the classification system discharges its function fully and effectively and has stood the test of time’ - is entirely unacceptable given the widespread consensus beyond Government that the system is not fit for purpose. The following article is the latest installment in Transform's long running campaign to get the Government to release its publicly funded research into the effectiveness of UK drug policy . It appears in this week's Economist magazine here. For more background see the links after the article.